But is Jerusalem not the capital of Israel? So why not recognize Jerusalem as Israel's capital? It's rare for countries to dispute the status of each other's capitals. The sticking point here is that Arab people in the neighboring West Bank and Gaza Strip territories also claim Jerusalem as the capital of their self-declared State of Palestine. Just making a competing claim isn't enough to inspire a worldwide boycott. But the thing is, the United Nations (UN) plan that first endorsed an independent Israel also said Jerusalem should be neutral ground between the Jewish country (now called Israel) and an Arab country (now called Palestine, though "Palestine" was originally a culturally-neutral name for the whole area). The idea was that Jerusalem and the surrounding area, including the Christian holy city of Bethlehem, would be an internationally-governed neutral zone known as a "corpus separatum" (Latin for "separated body"). 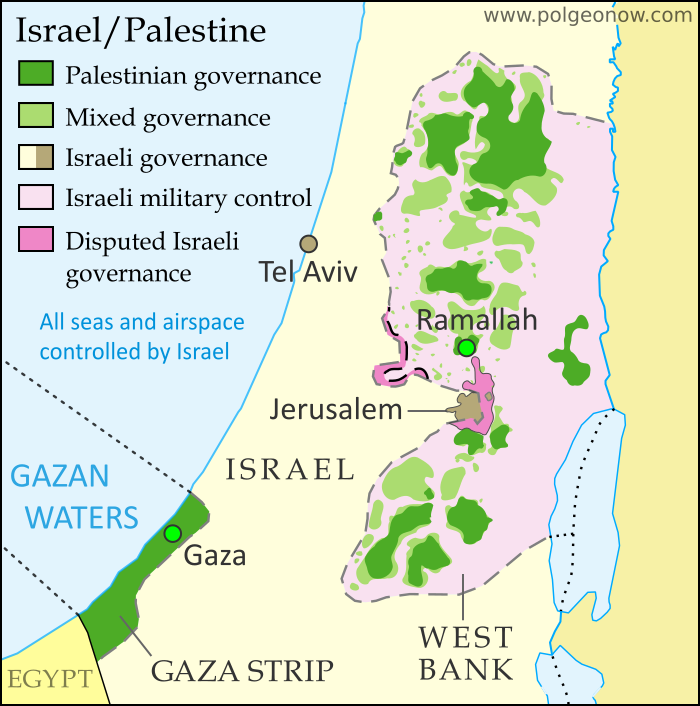 But Israel's 1948-1949 war of independence left western Jerusalem under Israeli control, and since the Six-Day War of 1967, Israel has controlled the whole area. Many think the neutral Jerusalem plan is as good as dead now, but many countries still support it in principile, even treating it as the official legal situation for diplomatic purposes. Even if they do think neutral Jerusalem is a pipe dream, most countries still support a future where Arabs will get their independent Palestine alongside Israel, and that usually means Jerusalem would at least get divided up between the two countries. In fact, US president Trump made a point of acknowledging that possibility even as he controversially recognized the city as Israel's capital. Which other countries recognize Jerusalem as Israel's capital? It's difficult to make a full list of countries that recognize Jerusalem's capital status, because there's no official register for them to record their positions in. Instead, we're stuck with looking at what their governments say, and trying to figure out what exactly they mean. Maybe the only two countries that seem to unconditionally accept Jerusalem's role as Israel's capital are Vanuatu, which reportedly recognized it earlier this year, and disputed Taiwan, which isn't even recognized as a country itself by most of the world. The Philippines has suggested it might move its embassy to Jerusalem, but doesn't seem to have made a formal statement of recognition. Czechia (the Czech Republic) declared the day after Trump's speech that it recognizes West Jerusalem, but not the whole city, as the capital of Israel. Similarly, Russia's government has said it thinks East Jerusalem should become Palestine's capital, and "in this context we view West Jerusalem as the capital of Israel". This was reported in some media as a recognition, but Russia's government declared that this week's US announcement "defies common sense", so it seems unlikely that's what they meant. Other countries have kept their statements vague or neutral, neither recognizing nor rejecting Jerusalem's claimed capital status. Then where are all these countries' embassies, if they're not in Jerusalem? Most countries, formerly including the US, don't recognize any particular city as being the capital of Israel. But all of their embassies are located in the city of Tel Aviv or its suburbs. In the early 1970s, there were 16 countries that did have their embassies in Jerusalem, but most of them left in 1980 after Israel claimed the city's disputed eastern half as part of its capital. By 2006, there were no more left. Even the US embassy is still in Tel Aviv for now, but President Trump says he plans to move it to Jerusalem eventually, maybe after another six months. If he does, it could be the first international embassy to return to Jerusalem, though several more countries might jump on the bandwagon. Most countries' representative offices to Palestine, on the other hand, are located near the Palestinian government headquarters in the West Bank city of Ramallah, or else in the coastal town of Gaza (ruled by a separate faction of the Palestinian government). In general, these offices aren't called "embassies" - either because the countries don't fully recognize Palestine as a country, or because they do recognize it but think the real embassies should be in Jerusalem. Yes, they do - ten countries, including the US, have "consulates-general" in Jerusalem. Usually a consulate-general is a regional office that serves under a national embassy, but these are special ones. The consulates-general in Jerusalem are officially representatives to the neutral "corpus separatum" area, not representatives to Israel. Because of that, they actually don't answer to their countries' embassies in Tel Aviv, instead reporting directly to their national governments. Despite their officially neutral status, most of them also serve as their countries' representative offices to the Palestinian government in the West Bank. At least Israel and the Jewish people must be happy about this, right? Yes and no. Israel's conservative government enthusiastically supported the US recognition of Jerusalem as its capital, and many Israelis are celebrating. But some think it would have been better to wait until the Israeli-Palestinian conflict is resolved, and others don't think it should be a big deal. Some of the biggest Jewish groups in the US also approved of the decision, but a big portion also disapproved. Many Palestinians, including Arab Christians, were furious with the symbolic gesture. This may or may not include Arab citizens of Israel, most of whom consider themselves Israelis but disagree with aspects of the country's governance.